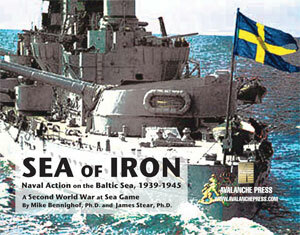 By the early 1920’s, the balance of naval power in the Baltic Sea had shifted to the north. Weimar Germany had a handful of obsolete pre-dreadnought battleships, and seemed likely only to use those for training duties. Soviet Russia had a quartet of leftover dreadnoughts, but none were in service and some had suffered serious damage from British attacks, accidents, and simple lack of maintenance. That left Sweden’s trio of modern coast-defense battleships as the most powerful warships in the Baltic. Sweden’s unique naval doctrine built the fleet around a series of ships the Swedes called “armored ships” (pansarskepp) but usually referred to as “coast defense ships” in foreign literature. The concept began with several classes of monitors, and in the 1880’s these were supplemented with much larger ships more suitable for deep-water operations. The Swedes intended for these ships to operate among the many islands between Sweden and Finland in support of the monitors and gunboats (the so-called “armored fleas”) that followed them. 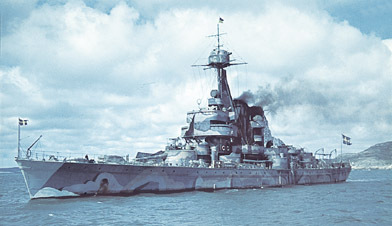 Sverige in her World War II colors. Tension over Norway’s desire to break away from the combined kingdom led to a spurt of construction just after the turn of the century, with six ships built between 1900 and 1905. Peaceful resolution of that crisis led to a lull in naval construction, until the Swedes laid down a new and much more powerful class during the First World War. Public subscriptions paid for the first ship, Sverige, with the government on the hook for three more, only two of which would actually be built. The “Fourth Ship” became shorthand in Swedish political/military discourse for renewed construction of heavy warships in Sweden. By the 1930’s most of the ships built just after the turn of the century could no longer be maintained and the oldest became targets, seaplane tenders or barracks ships. The others were reconstructed, but nothing could be done about their light armament or slow speed. During the late 1930’s, when the Swedes finally realized that the League of Nations would do nothing to protect them from the Nazis or the Soviets, Sweden began a crash program to modernize its armed forces. And at the centerpiece of the Navy’s plans lay the “Fourth Ship,” a new coast-defense ship that would actually have been built in a full class of four. The new design could not be built in time, and the Swedes tried to compensate by buying cruisers from other navies, but could not strike the deal they wanted. The four ships of the Äran (“Honor”) class were laid down in the early 1900’s, and saw a great deal of patrol duty during the First World War (all four appear in our Jutland game). One, Wasa, was found in too poor shape for rebuilding and became a dummy ship with a fake superstructure meant to resemble the Sverige class. Äran went into dockyard hands for rebuilding in 1939 after spending the prior six years in reserve, but test-firings of her main armament caused extensive damage to her frames and she was relegated to harbor service until deleted in 1947. Tapperheten (“Bravery”) and Manligheten (“Manliness” – the second-best ship name in the Baltic) received a thorough rebuilding between 1938 and 1941, with their armament modernized, anti-aircraft guns, new fire-direction systems, and a mixture of new oil-fired and coal-fired boilers. They emerged looking very modern, but retaining a very low speed. Their armament remained very light (two 8.2-inch and six 6-inch guns). 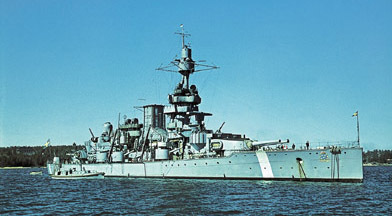 The next of the old ships, Oscar II (“Oscar II”), was modernized between 1936 and 1939 along similar lines with improved main armament (two 8.2-inch and eight 6-inch guns), new anti-aircraft armament (new Bofors 57mm anti-aircraft guns replaced the old 57mm light guns, plus additional weapons), new boilers (again, a mix of oil and coal firing) and a new fire-direction system. She was not rebuilt as thoroughly, however, and spent the war as a station ship and training ship based in Stockholm. Afterwards she was handed over to the Swedish fire academy, who used her to practice fighting fires aboard ships until her scrapping in 1974. Sweden’s three old coastal battleships were considered a last-ditch line of defense during the Second World War, but as late as May 1945 they had major roles assigned to them in the projected Swedish invasion of Denmark. With their excruciatingly slow speed, and armament no better than that of a small cruiser, they would have been easy prey for most enemy ships they might have encountered. That’s not the case with the rest of Sweden’s battle line. The three ships of the Sverige class formed the backbone of Swedish naval strength. While the three older ships would remain among the coastal islands and support torpedo craft, the three modern ships would attempt to locate and engage an enemy invasion fleet in the middle of the Baltic Sea. Toward this end they had a much stronger armament (four 11-inch guns, six six-inch guns) and much greater speed. All three were modernized in the late 1930’s, with oil-fired boilers that increased their speed, new fire direction and an anti-aircraft suite. But the fourth ship, to complete the division, never would be built. She’s included in Sea of Iron anyway (and was in Jutland, too). We also have the follow-on class projected for the late 1930’s. The Swedes studied a number of designs, both foreign and domestic, and both (relatively) large and small. The bigger ships usually carried 11-inch guns, with 8-inch guns arming the smaller ones. One unique proposal featured a monitor with two 15-inch guns, that would partially submerge during battle to lower her profile to just the turret peeking above the waves. We included four examples of one of the favored designs, a ship proposed by the Italian firm of Ansaldo armed with six 11-inch guns, a strong anti-aircraft armament and good protection. They would have been built in Swedish yards, and would have been a potent adversary for German or Soviet opponents – at least when operating together. Individually, they would have been easy prey for a real battleship, but the Swedes intended that they (or the Sverige class) never operate alone.